"All world events revolve around five things... M.O.N.E.Y." says Robert Miller (Richard Gere), and thus the stage is set. Arbitrage is a movie about money, yes, but not in the way you think. It is more about keeping up appearances, and if that means being a dishonest person, then so be it. After what seems like a pretty long period, Richard Gere is back with the kind of drama that he excelled in 15 years ago. This time, he plays a grandfather (imagine! ), who does what he can to save his family and to secure the future of his children, with a calculated coldness that freezes out other seemingly important people and events in his life. So Robert Miller is a very high-profile, CNBC-regular hedge fund entrepreneur. He has it all - the lovely children, the gorgeous wife, a great house and an even greater life. What he manages to hide from his family is that not only does he have financial troubles that threaten to ruin his existence, but also he is in love with an artist, Julie (Laetitia Casta), whose work the Millers patronise. In fact, the constantly-delayed merger that can save his skin, and his affair with Julie, are his two obsessions at present. Unfortunately, he finds himself failing to meet his mistress's expectations, and in an effort to salvage that relationship, he decides to take her away on a trip. What follows is a predictable tragedy, but then the story takes an unexpected turn, and it transpires that Robert Miller is a man without scruples when it comes to keeping his reputation and family safe. Despite his concern for his family, Miller finds that there is only one person he can turn to in his time of need. And that person is neither a friend nor family. The plot thickens when the loyalty of this unlikely ally is tested. At times, it seems like Miller is depending too much on this person's reliability, and then you wonder why this person would want to remain staunchly faithful to Miller. The beauty of the story lies in the flawed protagonist. Miller is not somebody you would conventionally want to defend, or even make excuses for, but somehow, you do. Despite the character's dubiousness, and indifference to the hurt he causes others, you end up sympathising with him. Richard Gere plays the not-so-nice Miller with élan, true, but it is the screenplay that is the real hero here. The director is apparently inspired by the 1990s movies on infidelity and fraud - or at least his shooting style is. The plot is not very complicated, and the end is a bit of a letdown despite the ultimatum that Miller gets from his wife (Susan Sarandon) due to which he bows down to her wishes. Given his callousness, it seems incredible that he could be intimidated by her. The inter-personal relationships between the family members, and also those of Miller with his advisors, colleagues and others, are a little sketchy, and not too strongly emphasised. Perhaps the intention (of the makers) was to confuse the audience and thus make the plot unpredictable, but it makes the flow of the screenplay a little tedious. Richard Gere, with this role, has been compared to Michael Douglas, and that may be a bit off the mark. 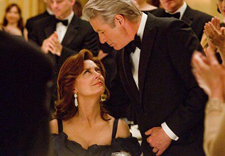 Gere manages to elicit empathy with his portrayal of a tycoon who can lose it all very soon. Miller is a mean man who is very difficult to hate, unlike Douglas's depictions of a man in a soup. Richard Gere, the only hero in the film, is present in almost every scene and pulls off his character with ease and style. Susan Sarandon has a smaller role as Miller's wife, but she shines in all the scenes that she appears in. From wide-eyed admiring wife to a protective mother, her arc plays out very well, and not too many actors could have been as convincing as she is. Tim Roth almost reprises his character from the series Lie To Me, except that he now speaks with an American accent. He is more or less the comic relief between scenes. Brit Marling as Miller's daughter seems slightly miscast, but she manages to pull off the role. Stuart Margolin as Miller's advisor and Laetitia Casta as his mistress do a decent job. After Gere and Sarandon, it is Nate Parker who impresses with his acting skills. The pathos that he brings to his character is so real that you find yourself identifying with him immediately. 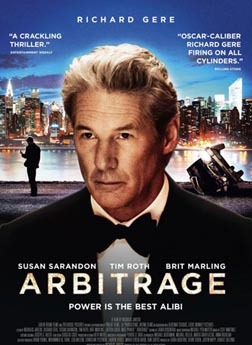 If you like drama-thrillers/crime, then Arbitrage is a good way to spend your weekend. Do not be too overwhelmed by the use of business terms in the movie, because at the end of it all, the film is actually about honour and ethics, or rather, the lack of them. fullhyd.com has 700,000+ monthly visits. Tell Hyderabad what you feel about Arbitrage!